On a Sunday afternoon when the Detroit Lions played and kids prepared for another week in the school year, more than 1,000 people gathered at Michigan State University’s ‘The Rock’ off of Farm Lane to celebrate those whom have endured the sting of Alzheimer’s disease and fund the pursuit for a cure. Beverly Lawrence, along with dozens of her family members and friends, split up to walk either the 3 or 5K in celebration of the life of Bev’s husband who passed away after his decade-long battle last December. The family traveled from all areas of the state to ease the pain, but had their remembrance stirred by recent comments by Televangelist Pat Robertson. The Minister said that divorcing a spouse inflicted with Alzheimer’s is justified while also stating that the disease “is a kind of death.” “There are reasons for divorcing a spouse, but having Alzheimer’s is not one of them,” remarked Beverly’s daughter Erin Cuthbert. Her feelings were shared by her Aunt Cheri: “Boy was I mad. If he would have said that to me, I would have slapped him. 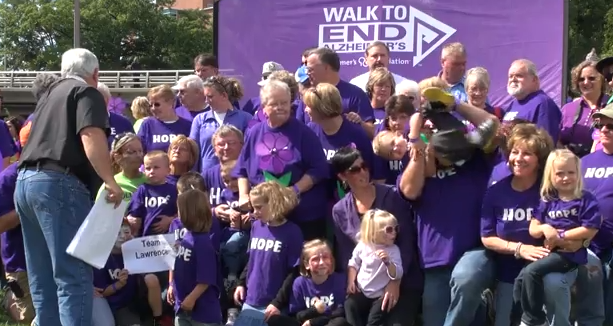 The family expects to grow in numbers and determination to end the disease and return to campus for next year’s walk. For some local Lansing businesses this past summer was not as profitable as many were hoping. Not because of a lack of interest from customers but because of summer long road construction spanning from early April all the way through October. It was the city’s goal to have Saginaw street and the surrounding highways resurfaced by early September. The plan for the project consisted of breaking the road down into smaller sections so the entire street was not blocked off at once.